A little over two years ago, even before we formed Wellman Wilson Consulting, we started a little conference called Social Capital. Ottawa needed a place for social media users to learn here in our hometown. To our surprise and delight, news of the conference spread and we’ve had attendees come in from Montreal, Toronto, even as far away as Alberta. We’re in our third year and we’re looking forward to hanging out with everyone who’s planning to attend on Saturday, June 1st! Tickets will be going on sale in March, so it won’t be long now - the year sure is flying by! You can find out more information about the streams on the Social Capital blog. We’ve even provided some excellent speaker application tips to help prospective speakers prepare their proposal. We have a multitude of oppotunities for sponsoring businesses/organizations to increase their exposure to our attendees and beyond. Email us at info@socialcapitalconference.ca to find out more about sponsorship or ask any other questions you might have. The sooner you sign on as a sponsor, the more opportunities for exposure you’ll have! 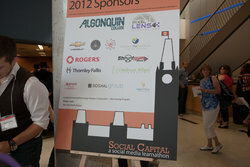 Will you be attending Social Capital this year? I am developing a series of workshops to help people feel more comfortable with social media - in using it for personal reasons or for business. I often either get asked what the purpose of something is or get told it is of no value. I agree that every tool isn’t for everyone, but sometimes you just need to hear in plain words what something is for, with some examples of why and how it can be used. I am putting together a workshop that will do just that. I am working on a basic list of tools with descriptions and examples. My entire workbook with all the descriptions will be handed out to all students but we will go through and try out about eight during a two hour workshop. What I want to know from you guys is - what are the tools you have questions about? Here is the list I have so far (it’s a work in progress) but I would really appreciate your input on this! SEO is important - as a wise friend once said when questioned about the value of SEO - popularity gets people to your current blog posts, SEO is what gets people into your archives. Search Engine Optimization isn’t a new concept but I’ve always had a hard time remembering to do it. I often am writing my posts at the last minute, or I just want to get them online, and I forget to add all the tags that describe the post. Then, thanks to Sherrilynne, I discovered Zemanta and it automates the process. Making the process easier is always a plus in my opinion! Once you’ve installed Zemanta it works as you write. It analyzes the words in your post and it finds photos that might be a good fit, it comes up with links to definitions and web sites about the words in your post, it suggests news related links and it suggests tags. Nothing is automatically added, you get to then quickly click on all of the things you’d like to add to your post and it’s done. It’s made me someone who always has tags and more links - something I definitely didn’t have before. I highly recommend it to anyone who blogs! Has it made a difference in the traffic to my sites? I’m not sure - but at least it’s easier for me to do the work I know I’m supposed to be doing in my posts! Are you good at tagging and making sure your posts are written for search engine optimization? Do you use something different than Zemanta? I would love to hear about it!